In today's world, there are maybe a handful of things that truly impress us anymore. These include: 3-D printing, interspecies friendships, space exploration, and running a world champion track race barefoot. The latter was accomplished on Tuesday morning, when U.S. runner Jenny Simpson finished the 1500m race without a shoe at the 2015 IAAF World Championships in Athletics in Beijing. While most people would have bowed out of the race as soon as their shoe came off, Simpson finished the final with one barefoot, and afterwards showed off her bloodied foot like a brave soldier displaying her battle wounds. She might have redefined the meaning of impressive. According to tweets from the scene at day four of the IAAF World Championships, Simpson kicked off her left shoe with 600 meters to go during the 1500m finals and finished the rest of the race without it. It's unclear what caused Simpson to ditch her sneaker, but it was most likely interfering with her running. Instead of settling for a mediocre performance, Simpson took a risk and finished with one bare foot, placing 11th. For the 2011 world champion, 11th place might not be a highlight of her running career, but finishing a race with one shoe should be — it's awe-inspiring that she placed at all considering the circumstances. 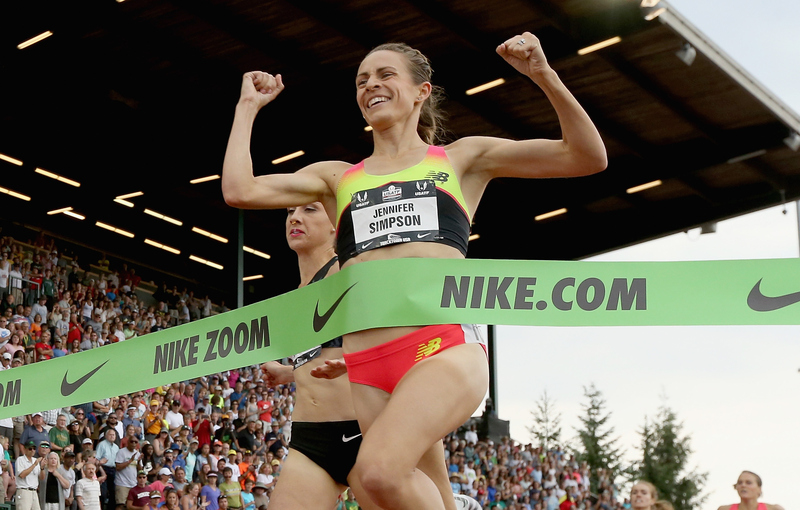 Simpson is an American middle distance runner and steeplechaser who represented the U.S. at the 2008 Beijing Olympics when she was a student at the University of Colorado. After qualifying for the first women's steeplechase in Olympic history, Simpson set a new American record and finished ninth. Leading up to her appearance at the 2015 IAAF World Championships in Beijing, she placed first in the 1500m race at the U.S. Outdoor Track and Field Championships in Eugene, Oregon, in June. No doubt her friends, family, and fans were anticipating a better finish for Simpson, but when it comes to her performance, they should still be proud. Think about the last time you walked barefoot across your living room floor and stepped on a screw or even a pretzel piece — not the best feeling, right? Now imagine running as fast as you can barefoot on synthetic turf for 600 meters with the world watching and your career hanging on your every step. Now that's impressive.